This one I took when we were hiking through Wells Gray Park. There were a lot of beautiful waterfalls along the way, one of them is Bailey's Chute, this path was leading up to that fall. Bailey's Chute is one of the wildest rapids on the Clearwater River. During high water in early June, the roar of the chute can be heard a kilometre away. The Clearwater River is a tributary of the North Thompson River, joining it at the community of Clearwater, British Columbia. 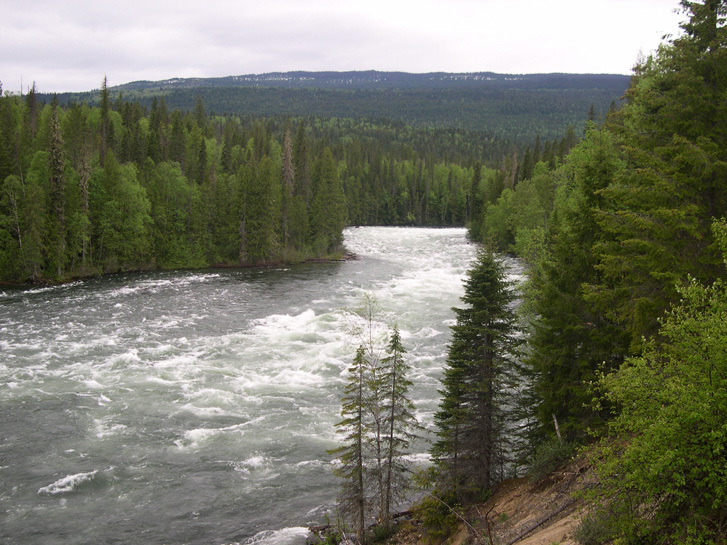 The Clearwater runs from Azure Lake through Clearwater Lake through Wells Gray Provincial Park. Exellent landscape shot.I like POV and composition.Good sharpness and lovely colours. Looks like this is early summer, with water from melting snow filling the river! Good lines created by the winding river, beautiful green colour in early summer! I have wondered what Wells Gray Park is like so I appreciate your photo. I like the concept of the river winding into the distance and the foreground trees overlapping it. The photo looks to me to be mostly midtone values which robs the scene of some of the drama this rushing torrent of water should have. I did a short workshop to see if I could strengthen the values a little. Prachtige foto van een erg mooie omgeving. Erg mooi hoe je de rivier van links onder naar boven laat lopen. Qua kleuren is het wel een beetje flets, maar goed het weer zat ook niet echt mee. Very nice landscape.Tint green forest with wild river they are very impressive.I like composition and atmosphere this shot.Good work.Thanks for sharing. Wat een prachtige bosrijke omgeving Nel, erg mooie compositie met de rivier tussen al dat bos. Ik zou hier wel een paar maanden willen rondzwerven. De kleur van het groen is ook echt mooi fris groen. Congrats! Je hebt nu net 1000 punten! Mooi landschap met typisch Canadese scene. Snelstroomend water. Mooi he! J.